This article was originally published in a periodical entitled "The Buckskinner Magazine" in the 2005 February/March issue. "Hold!" "Hold!" The sound of thundering galloping hooves matching the beat in your chest. A massive weight heavy on your shoulders. Andreneline pumping through your veins. Sweat running down your brow. It seems just yesterday you were tilling the soil, preparing to plant your crop. "Hold!" The order is repeated once again. You hope your son is giving proper care to the livestock. "Make ready!!" The order is barely audible over the thunderof hooves as the enemy cavalry bears down on your line. "Give Fire!!" You hurriedly thrust the red hot wire into the vent of your gonne. "Pha-toom!" A sheet of flame, a wall of smoke and a hail of shot burst forth, mowing down both armored knights and mounted steeds like ripe wheat falls to the farmer's scythe. Now many of you are probably scratching your heads. Armored knights mowed down by gun fire? Say what??? "What is this? Science fiction?" It actually happened. The details of such battles are sketchy, bits of information being found in ancient manuscripts and codexes, as well as medieval paintings and drawings. The earliest "handgonnes" were bronze, bottle shaped, firing arrow projectiles. They started appearing in Europe around the early 1300's. In 1410, the Hussites, using handgonnes, defeated the Teutonic Knights. 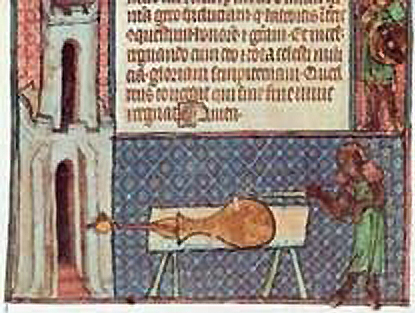 image found in "De Nobilitatibus, Sapientii et Prudentiis Regum". Early handgonnes, or Pistolà as they were known, were little more than small cannons on a pole. But don't believe they were crude creations, even though some were. This was an age of experimentation both for gonnes and gunpowder. Early gonne makers experimented with dual chambered gonnes and more. Many were the recipes for producing blackpowder. Boiling down manure and urine of both livestock and humans to produce nitrates. Making charcoal from white willow or alder wood. Sulphur obatined from the smelting of copper and lead ores. One recipe I saw require the mixture to be stomped like grapes for thirty hours! Early gonnes ranged in calibers from 13mm to full blown cannon bore sizes. Gonne designs and shapes were just as numerous, and rifling had yet to arrive as an idea. 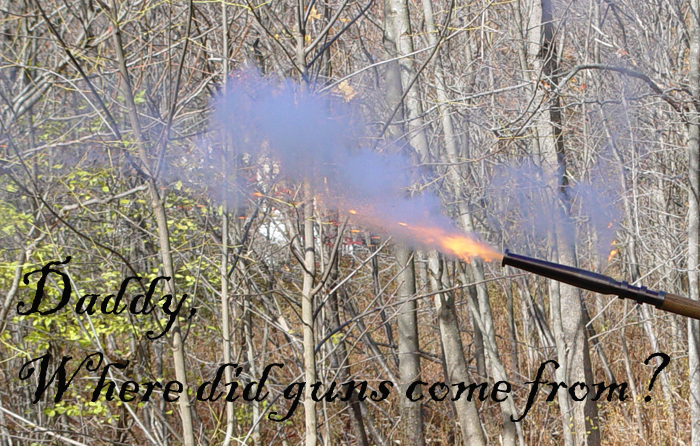 Today, there is a revival of interest in these primitive smooth bore firearms. What could be neater, dressing in armor, battling with sword and axe and blasting away with your own personal artillery? The period, that many are starting to take interest in, is but a wink in time. But be ye warned! Realize that "Gonning" is a red headed stepchild. Falling somewhere between medieval re-enactment and buckskinning. So don't expect everyone to share your enthusiasm for the devil's toy. Like with anything new, the organizers of medieval type events have to be won over. And the biggest concern they will have, and you should too, is SAFETY. At these crowded events, mostly you will be firing blanks, and even blanks can cause serious harm or death. Wadding may not be rock hard, but its still a projectile when it comes blasting out a barrel. So besides being careful, it will behoove you to bone up on state and local fire codes and weapons regulations. Even noise levels can be a factor, so be prepared, arm yourself with knowledge and the printed word. A good attorney is a great charm to ward off the evils spirits of ignorance of the law. The first basic step of becoming a fully addicted gonner is developing your persona, because like I always say, "you don't know who you are, until you know what you are." "Who Are you? Who Who?" Sorry about that, couldn't resist. Once you've decided that, then you can start to flesh out your kit and gear. Be sure to find historical references to authenicate your gear. Just like any area of living history hobbies, you will run across "stitch nazis" and "button counters". You need more than just a gonne. 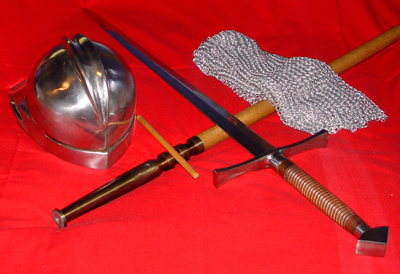 Here's a few basic items: helmet, gonne, sword and chainmail. Armor and weapons will be your biggest cost, should you decide to persue this hobby/life style. More often, than not, you will have to buy these items from craftspeople and third parties. Ebay abounds in these goods. Clothing is available there, as well, should you or the missus be unable to do needlecraft. Other items you will need to get is period footwear and "feast gear". 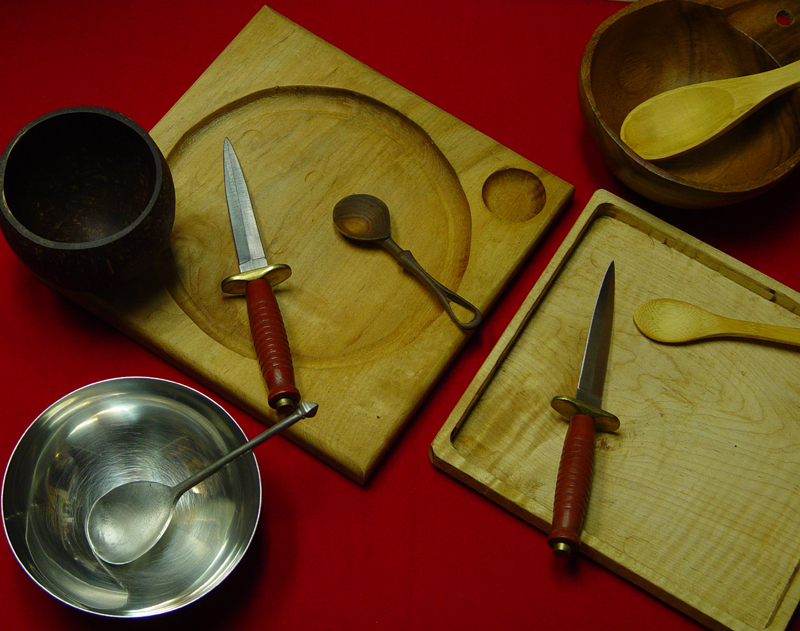 Personal feast gear consists of mug/tankard, plate/trencher, bowl/ noggin, spoon and a small fixed blade sharp knife. Butter knives and forks had yet to make the scene in this time period. And if you really want to be period correct, right hand only. Why? Because there was no toilet paper and your left hand was used for wiping your bum. Some basic feast gear kits. The cup is a coconut shell, yes, this was period and considered a treasure of the time. But, where can I get a gonne for myself? There's not many advertised gonne manufacturers. In fact, there's only two American ones that I know of, and those are handgonnes.com and The Rifle Shoppe at http://www.therifleshoppe.com. I've been in contact with Graywolf of handgonnes.com via telephone and email, and he assures me that he will be up and running by Feburary 2006? and plans to be back into full production by March. He has at least one new design he will put into production, and plans to add others. Keep checking his website, www.handgonnes.com for updates. This site had problems in the past, but should be up to full steam by the time this article goes to press. Then again, if you have a metal working lathe or you have the time and ambition, you can always drill and file one out yourself. Never grind! The heat from grinding affects the hardness of the metal, so instead of a gonne you have a grenade. But, the most important safety tip here is to know what you are doing! Using the wrong metal can result in you having a grenade rather than a gonne. Czech edition, late 1950's, Art by: Eduard Wagner. Designs for gonnes are many, some octagon with figural pieces, others looking like nothing more than cast iron sewage pipe on a pole. Calibers range from pea shooter to full bore artillery pieces. Wall gonnes and siege gonnes are the largest gonnes of this period. Some are fired over the shoulder, others under the arm and still others use special shield emplacements called pavises. 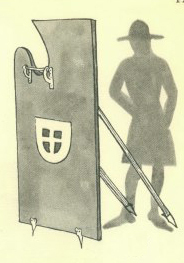 A pavise is a large shield used during sieges to protect archers and gonners. These large shields had supports to hold them up and acted as temporary walls to protect the attackers. slow match on a linstock, hot wire and punk sticks (Stick Incense). There are three basic types of ignition, all of which require stringent personal safety practices. Gloves should be worn during all gonne firing sessions. I use the left hand, right hand method of safety with all forms of gonne ignition. I keep all ignition sources to my right, and all powder and powder charges to my left. I turn to my left to charge and prime my gonne. NEVER LOADING FROM A POWDER FLASK OR HORN! I reach to my right to grasp my selected method of ignition. Then, take aim and give fire. The First type of ignition, and considered by some the most period correct, is the red hot wire. This will require, not only a wire, but, a charcoal braiser to insure that the wire remains red hot. So, here you have two possible heat sources that could cause an accidental powder ignition. In others word, BOOM! "dUH, what happen?" Next method, is the SLOW MATCH, a length of either cotton or hemp rope that has been nitrated. This is the most widely recognized form of ignition for this period of time. A slow match should be held by means of a linstock, never by a bare hand. Attention to the tip of the lit wick should be constant, not only to keep it lit, but, also to mind where any hot ash may fall. Failure to do so, may result in burnt body parts and even powder flask ignition. Lastly, we come to Punk sticks. These are my favorite form of ignition for my gonnes. I find they need little or no attention to keep lit, once you have them going. They can easily be stuck in the ground during loading. Plus they smell a heck of a lot better than the smoke from a slow match. They are easily obtained at your local Asian Market, or flea market. Another name for punk sticks is stick incense. Right now, the many who are gonners are simply trying to gain acceptance at various medieval events. Many such events preclude the use of projectiles. So, its a whiz bang show for the masses. But these gonners are also competing between themselves, off site, using round ball projectiles. Some may use a patched ball, whilst others use an unpatched ball, either is correct for this time period of firearm experimentation. There's no prizes, no rewards, other than the fun and enjoyment of the comradery of the fellowship of the gonne. Grab your tiller, grab your balls! We're off to have a free for all! Pictures from the 2004 Battle of Harburg festival in Germany.